When galaxies assemble extremely rapidly, and sometimes violently, it can lead to the formation of a massive black hole. Zoom of the inner 30 light-years of the dark matter halo. The rotating gaseous disk breaks apart into three clumps that collapse under their own gravity to form supermassive stars. LIGHT THAT WAS released more than 13 billion years ago to create black holes have begun to reach our telescopes, helping to solve the cosmic riddle on the birth of massive black holes in the early universe. 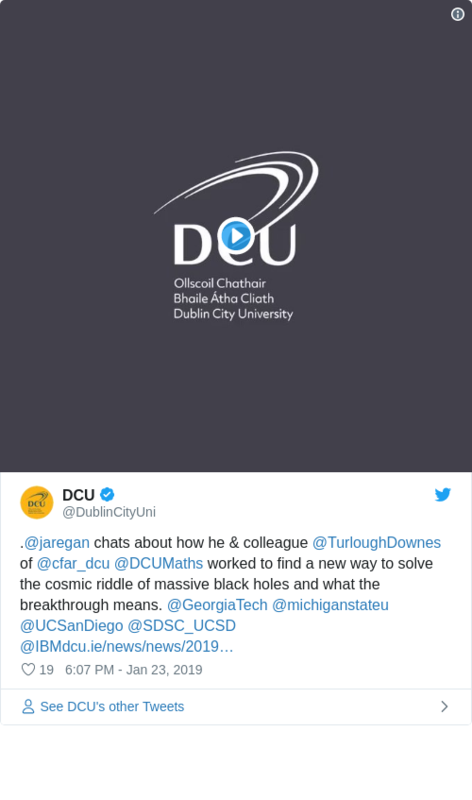 Researchers from Dublin City University (DCU) have been involved with the major breakthrough with the discovery of a new pathway that explains the existence of massive black holes in the universe and predicts a greater number than previously thought. According to researchers from DCU’s Centre for Astrophysics and Relativity, the light released from around the first massive black holes in the Universe is so intense it is able to reach our telescopes across the Universe. The light from the most distant black holes (or quasars) has been travelling towards earth for more than 13 billion light-years, allowing us to look back in time to the early universe. Until now, the mystery how these giant black holes formed remained unknown. Dr John Regan and Professor Turlough Downes from DCU collaborated with research teams from Georgia Institute of Technology, Michigan State University, the University of California at San Diego, the San Diego Supercomputer Center and IBM to solve the cosmic riddle. The teams discovered that when galaxies assemble extremely rapidly, and sometimes violently, it can lead to the formation of a massive black hole. It had previously been believed that massive black hole formation could only happen in regions bombarded by powerful radiation from nearby galaxies. The rapid assembly of gas means that instead of normal star formation proceeding, embryonic stars become puffed up by hot gas. This leads to the formation of what is called a “supermassive” star. Supermassive stars can only survive for a short time before quickly collapsing into a massive black hole. “At first when we found these black hole formation sites in the simulation we were stumped. Previous theories suggested this should only happen when the sites were exposed to high levels of star-formation killing radiation,” Dr John Regan said. As we delved deeper we saw that these sites were undergoing a period of extremely rapid growth. That was the key! The violent and turbulent nature of the rapid assembly, the violent crashing together of the galaxy’s foundations during the galaxy’s birth prevented normal star formation and led to perfect conditions for black hole formation instead. According to Dr John Wise from Georgia Institute of Technology, one of the biggest scientific challenges in this kind of work is being able to figure out what happens in a large portion of the Universe, while still being able to detect what’s going on in important, but small regions. 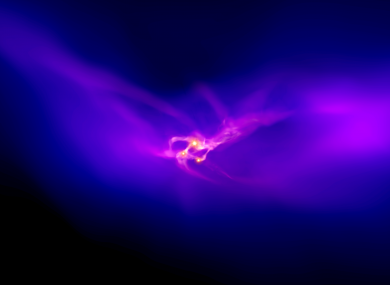 “The Renaissance Simulations of the early Universe, on which this research is based, achieve this by working out “on the fly” where interesting things are happening and focusing a lot of effort there,” Wise said. Email “DCU researchers help solve cosmic riddle on the birth of massive black holes in the early universe ”. Feedback on “DCU researchers help solve cosmic riddle on the birth of massive black holes in the early universe ”.